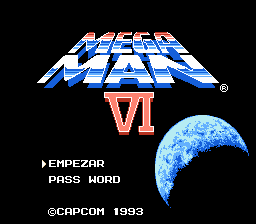 Mega Man 6 is a platforming game for the Nintendo Entertainment System. A robot battle tournament was held by the mysterious billionaire Mr. X. Eight Robot Masters from around the globe was invited to participate. But during the event, they went berserk and commandeered by Mr. X declaring his intent to rule over the world. 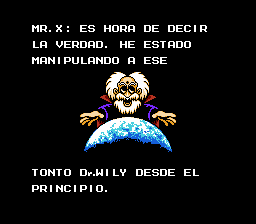 With plot seems familiar, Mega Man decided to stop Mr. X like what he did with Dr. Wily, who mysteriously went missing. 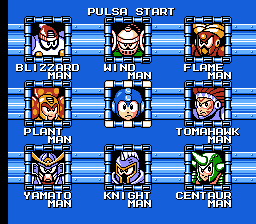 A new support feature for Mega Man is added, namely Rush the robo dog fuses with Mega Man to form Power Mega Man, a wall-busting armor, and Jet Mega Man, a short flight ability armor. 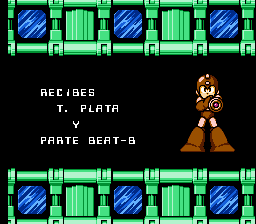 Translation to Spanish for “Mega Man VI”, for the Nintendo Entertainment System. 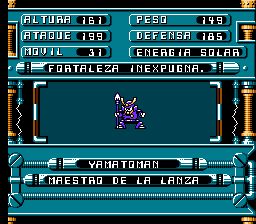 V1.1: Fixed fonts on selected enemy status.